The US Energy Information Administration (EIA) recently released their latest bi-annual count of crude oil storage volumes held south of the border, as well an assessment of how much additional capacity has been added over the past 6 months. The EIA makes an important distinction between shell capacity and working capacity. Working capacity excludes the bottom section of the tank (inaccessible since a minimum level of crude is required for proper operation of the outlet pumps) and the very top portion of the tank, usually kept empty for safety reasons. As a result, only 85% of the tank's total theoretical volume (shell capacity) is actually useable space (working capacity). Utilization rate is therefore calculated as a function of working capacity. Also note that the EIA excludes volumes held in Strategic Petroleum Reserves (SPR) and inventories in transit (volumes contained in pipelines and tankers) from its calculation of commercial inventory volumes. Crude oil storage tanks can vary greatly in size, but assuming an average of 500,000 barrels per tank, that works out to 72 new storage tanks built in the past 12 months (measured from March to March). 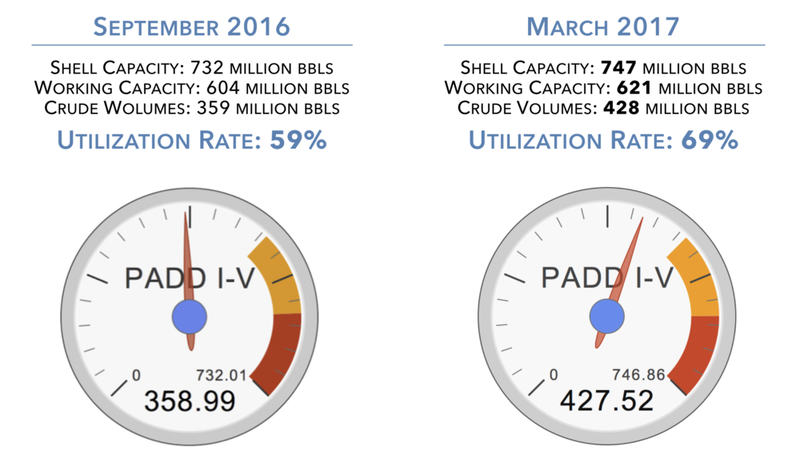 That may sound like a lot, but the pace of new tank construction is actually slowing from the frenzy years of 2014/15, where the US added 47 million barrels of capacity. Despite only a 2% increase in tank capacity over the past 6 months, the volume of crude being held in storage jumped by 20%, or 68 million barrels. That brings the total utilization rate from 59% to 69% since just last September. Since March 2011, the US has added almost 166 million barrels of storage capacity, an increase of 36%. At the same time, volumes held in storage has increased by 168 million barrels, an increase of almost 65%. That has brought the utilization rate from 57% to 69% over the past 6 years. The WTI contango price curve, which gives producers incentive to stockpile crude and sell at a later date (hopefully at a higher price). OPEC's production cuts last November pushed the futures curve into backwardation (where future prices are lower than the current price), but that hasn't helped reduce inventories in the US (or globally for that matter). Crude imports have been increasing since the beginning of 2016, by about 1 million bbl/day from 2015 levels. Although exports are also rising, they're not rising nearly as fast. US consumption remains stagnant despite expectations for record fuel demand this year. After peaking at 7.6 billion barrels in 2005 and bottoming at 6.7 billion in 2012, only 7.2 billion barrels of oil were consumed last year. And that number doesn't appear to be rising by much this year, blamed in part on better vehicle fuel economy. The Cushing storage facility in Oklahoma is one of the largest tank farms in the US and a major hub for Canadian oil. Cushing holds about 67 million barrels of crude, representing a utilization rate of about 88%. Cushing is an important oil trading centre in the US, serving as the official price settlement location for West Texas Intermediate (WTI). It has also been a major bottleneck in recent years, causing the US benchmark crude (WTI) to trade at a discount to international Brent prices. Despite being nearly full, very little additional capacity has been added in recent years. Historically, crude was imported into the Gulf Coast and pipelined north to the Cushing storage hub. That all changed in 2012 when Enbridge reversed its Seaway pipeline, bringing crude from Oklahoma down to Texas. TransCanada built Keystone's southern leg in late 2013, draining more volumes out of Cushing. Enbridge later twinned its Seaway pipeline, which also helped (temporarily) reduce inventory volumes in 2014. The US imported only 2 million bbl/day of Canadian crude in 2011. That number is now 3.5 million, more and more of that crude is headed to the Gulf Coast, and a lot of it is getting stuck in Cushing. If/when Keystone XL is built, you can expect more Canadian crude to be funnelled into Cushing and into the Gulf Coast. Last March, TransCanada announced plans to add about 6 million barrels of new storage capacity at Cushing, expandable to 20 million barrels. The Cushing tank farm currently holds 16% of all US crude oil inventories (about 67 million barrels), and has a total working capacity of 77 million barrels. Although that may not sound like a lot, it's almost as big as Canada's entire crude storage capacity. PADD 3 (Gulf Coast) accounts for about 55% of all crude storage capacity in the US. That excludes almost 700 million barrels of crude held in Strategic Petroleum Reserves, also located along the Gulf Coast. When SPR volumes are included, the Gulf Coast holds over 1 billion barrels of oil inventories. Aside from having the world's largest inventory volumes, the Gulf Coast is also one of the largest refining hubs in the world's, home to about 9.5 million bbl/day of refining capacity. That's about half of the entire country's capacity, last estimated at about 18.6 million. PADD 2 in the Midwest is the second largest oil storage hub in the US, accounting for almost a quarter of total capacity. Note that Cushing data is included as part of PADD 2 figures. The next update on US crude storage capacity will be released in November 2017.